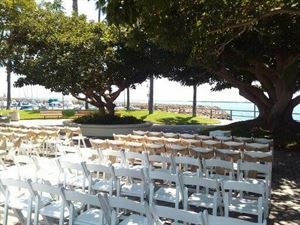 The Plaza at Cabrillo Marina provides an ideal setting for wedding ceremonies, receptions, community functions, business meetings and family gatherings. The spacious, one story facility is the hub of the multipurpose complex that includes the scenic Cabrillo Marina, excellent restaurant and the elegant Double Tree Hotel by Hilton. From the Plaza, its patio and courtyard visitors to the Marina can watch activities of nearby Cabrillo Beach. Capable of hosting events for up to 120 seated or 260 standing guests and up to 750 for outdoor events, the Plaza features convenient parking in the Cabrillo Plaza parking lot.